Motivating yourself every morning to hit the gym can be a daunting task, and it can become even less interesting, when you have to workout alone. Gradually, hitting the snooze button on your phone becomes a customary habit. Group exercises can be really motivating and even challenge you to achieve goals beyond your expectations. This is because even a little encouragement from a fellow mate or trainer can actually help you keep up or increase the intensity of your workout. 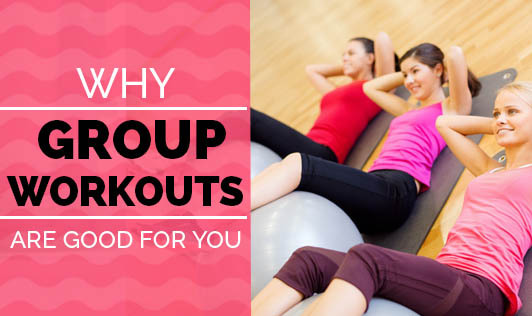 For novice exercisers, group workouts are actually the best. It can be quite intimidating on the first day when you have to be by yourself and work out alone. Group exercises can really help here. Each session will give you a chance to meet other people who are on the same level as you and will help get rid of the intimidation and discomfort. Attending a group fitness class gives you a chance to meet several people, and strengthen your social skills as well as expand your social circle. It is not all fun and play though. The sessions let you meet new people with whom you can share a lot of fitness tips, advice, and information. Group exercises are the best way to increase you energy levels on lazy mornings. Regardless of whatever classes you enroll in, be it power yoga, zumba, spinning, boot camp, or aerobics, you will come out feeling energized. The excitement and fun of working out with several people can be quite contagious. Sticking to a good exercise program is crucial for your health, and if you do not feel enough motivation for working out alone, group workouts can be great for you. The stimulation and passion that group workouts give is unbeatable indeed!